WORKS LIKE A UPS, BUT IN THE OPPOSITE DIRECTION! The SP-TS4500-12 will switch to the grid when the batteries are low, once the batteries go back to ~13.5 volts it will switch back over to battery power. NEW ITEM RELEASE! 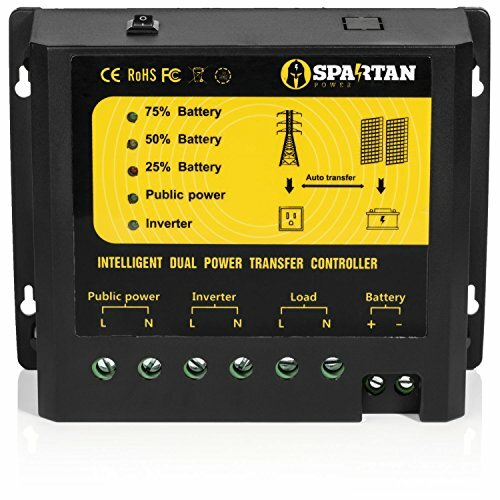 The Spartan Power SP-TS4500-12 12V dual power transfer switch allows for trouble-free operation of inverters and AC mains in the same circuit. 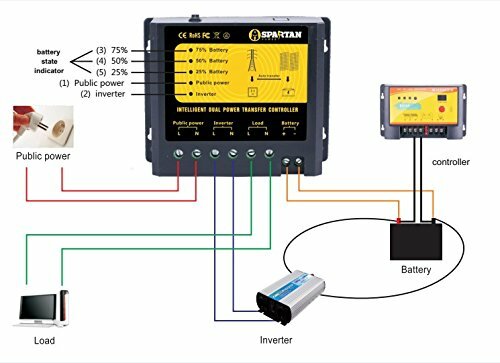 The dual power transfer controller switches automatically between inverter and AC mains while protecting the inverter against external voltage. Scenario 1:When the battery is fully charged by solar panel, or battery power is over 75%, inverter indicator (2) and battery state indicator (3) is lit green. In this scenario, power is provided by the off­-grid system. Scenario 3: When the power in battery is consumed to 25 %, public power indicator (1) is lit green, and battery state indicator (5) is lit red. 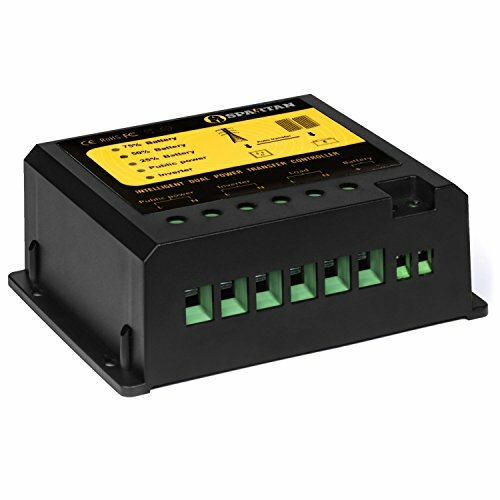 At this time the battery voltage is lower than 11V +/- .5V, the controller will automatically change the power supplier to public power in <10ms. In this process, power is provided by the grid. Scenario 5: When the power in battery is over 75%, inverter indicator (2) and battery state indicator (3) is lit green. At this time the battery voltage returns to 13.0V, the controller will automatically change the power supplier to battery in <10ms . In this scenario, power is provided by the off-grid system.